Chambers of Commerce and Tourism organizations are ready to help you plan your snowmobiling adventures in Maine. Several Chambers are involved in organizing and promoting winter festivals and events for snowmobilers, and offer seasonal trail conditions information for their area as well. Contact them for assistance in planning your snowmobiling visits to their area and they'll be pleased to help you. CHAMBERS: For corrections or additions to these listings, contact us at (207)622-6983 or e-mail the MSA. 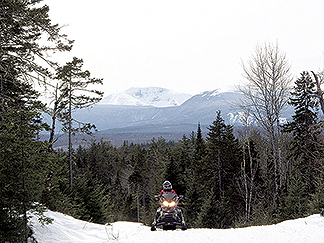 These free links are offered to any Maine Chambers and Tourism groups that serve snowmobilers. Photo By Larry Lafland. ITS 85 near Bowlin Camps, Northern Katahdin area. Flagstaff Area Business Association, 1216 Carrabassett Drive, Kingfield ME 04947, 207-235-6008.